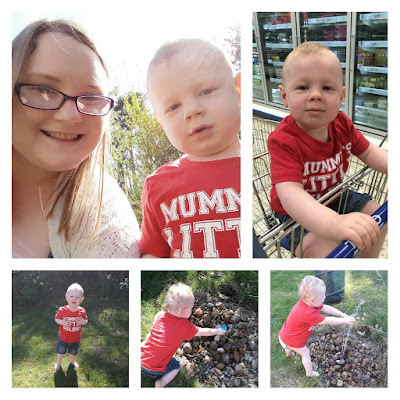 We have had such gorgeous weather recently and so we have been making the most of it and spending time outdoors. Yesterday we had originally planned to go the park and play ball games as well as bring Blake's scuttle bug with us. The plan changed as Stuart's phone had been playing up and so needed to pop to the other side of town to Tesco to get a new contract sorted. So we ended up spending time over at the In laws in their garden which Blake loved. He loved having the freedom to run around and loved playing with the little water feature. He even started putting his head under it and got soaked. It was lovely to see him enjoy being outdoors and we will be certainly making the most of days out in the sunshine this spring/summer. It looks as though the little one really enjoyed being in the garden! Its been lovely hasnt it - lets hope this is the start of a few warmer months!